I’ve had a nice break from blogging and enjoyed Christmas with my family. However I’ve been so excited to play with my new stash from the Stampin’ Up! Spring mini catalog 2013. This week’s challenge on Hand Stamped Sentiments is a color splash challenge of Primrose Petals, Pool Party and Basic Black. This project is based on a photo frame project in the spring catalog. Here’s my project giving you a sneak peek of the Hearts a Flutter Bundle. It contains the hearts a Flutter stamp set and framelits. It’s perfect for making a variety of cards. Please join us at Hand Stamped Sentiments this week. We would love to see your color splash project. Happy Valentine’s Day…You’re just my type! Today is Valentine’s Day and I wish you love! 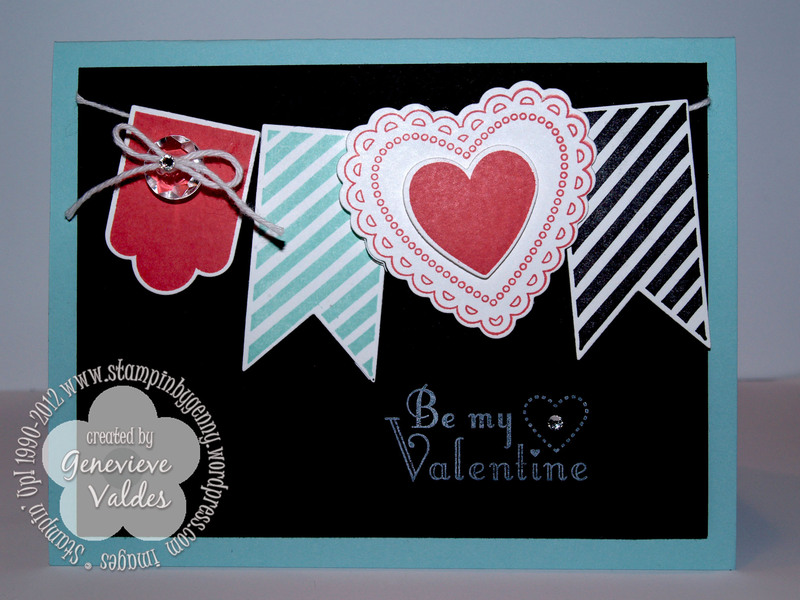 This week at Hand Stamped Sentiments we have a Valentine’s day Challenge. 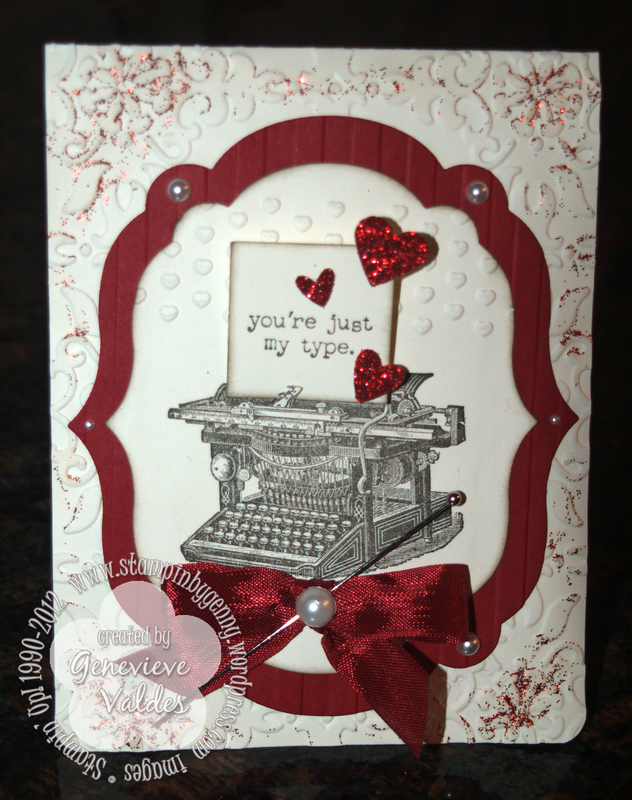 I love the old fashion typewriter image in the Established Elegance set but I also love all the sentiments in the ‘You’re my Type’ set so I combined both. I was going for a vintage feel and used Cherry Cobbler with Very Vanilla. 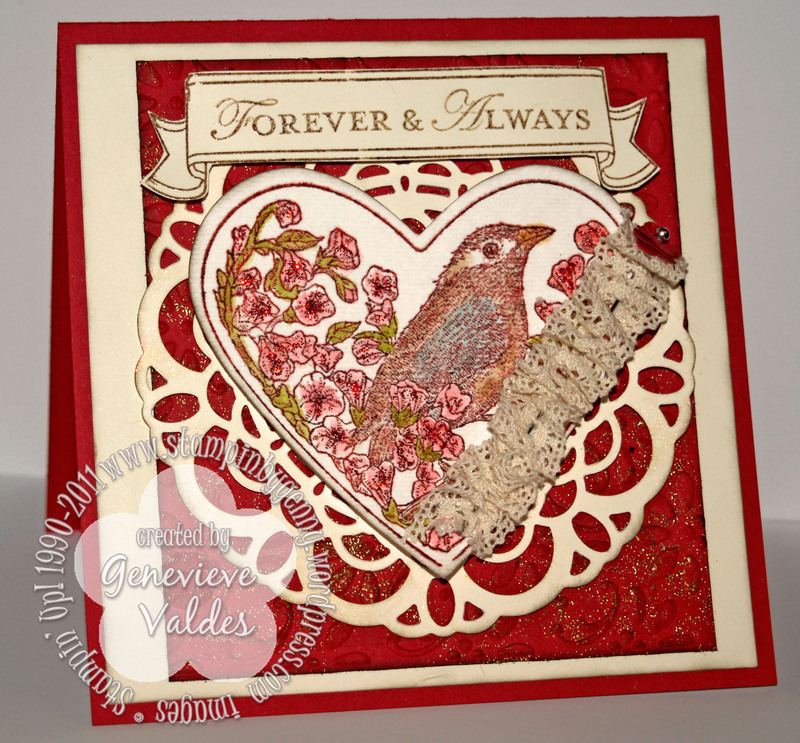 For a bit of sparkle I used the Dazzling Details in Cherry Cobbler on the embossed background. I also punched the hearts from red glitter paper. The label framelits are fast becoming one of my favorites. I love all the different sizes. The paper in the typewriter looks like it’s coming up from the rollers because I cut a notch at the paper holder on the typewriter and put the paper behind it. I hope you’re inspired to join us this week and spread the love by posting you’re Valentine project at HSS. After weeks of anticipation, it’s finally here–Sale-A-Bration is now in full swing! During Sale-A-Bration 2012, you can earn free products in three different ways. To celebrate Sale-a-bration I’ve been creating projects with some of the products in the Sale-a-bration catalog. This week at Hand Stamped Sentiments the challenge is gift items. 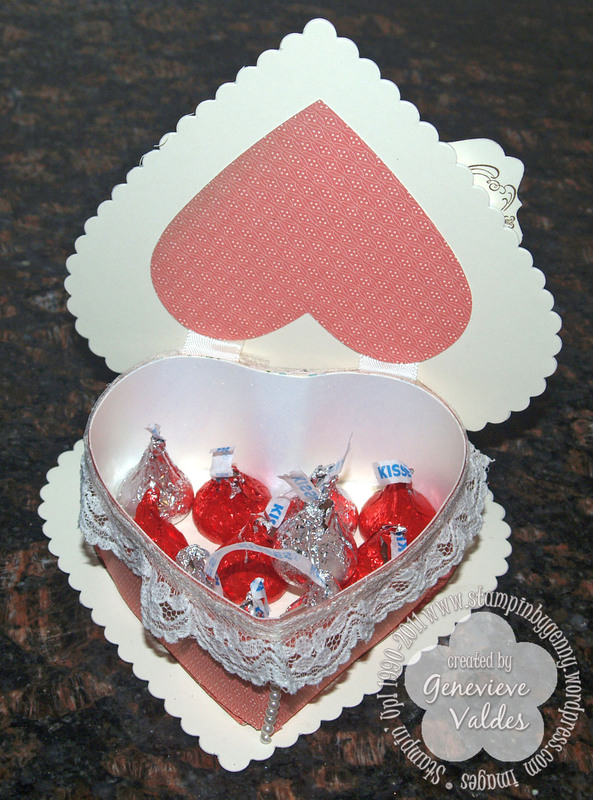 With Valentine’s just around the corner I made this heart box using the Everyday Enchantment Designer Series Paper which you can earn with a $50 purchase. 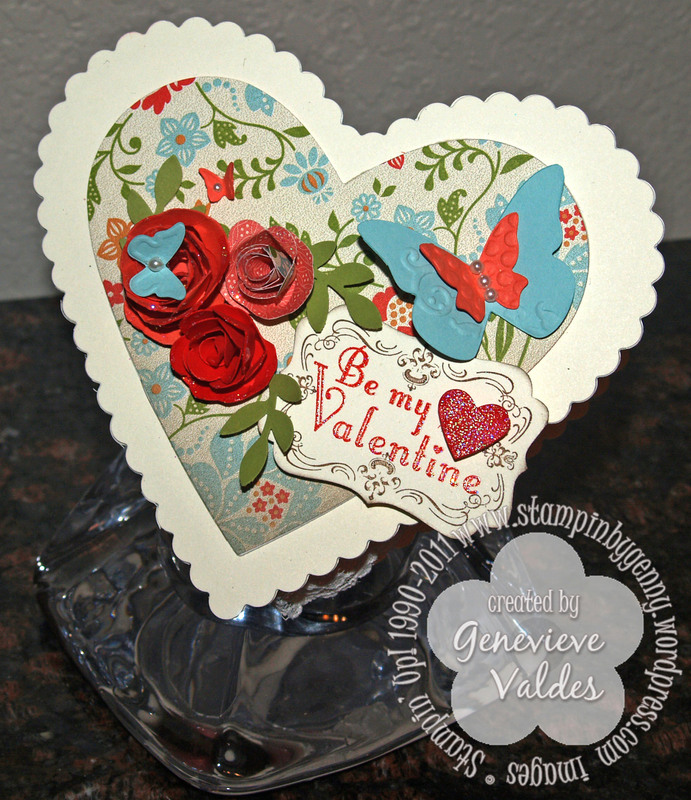 I used the Heart Framelits to create the box and I embellished it it with quill roses and butterflies die cut from the Beautiful Wi Sizzlit. To make this box I adapted the tutorial from SCS. I love the colors in the Everyday Enchantment DngsSP – Poppy Parade, Calypso Coral, Pool Party, Lucky Limeade, Very Vanilla and Soft Suede. These colors are so pretty together. I added some extra sparkle to the roses with Dazzling Details and embellished with basic pearls. The sentiment and the heart on the sentiment are embossed with Iridescent Ice embossing powder. To make this a sweet gift I filled the box with Hershey’s kisses. I hope you’re inspired to join us at HHS for this week’s challenge of gift items. Click here to see more inspiration from our very talented design team. How these days in January make me long for the beach. I guess I shouldn’t complain since the weather here has been sunny and in the 70’s but I just can’t help thinking of long summer days at the beach. 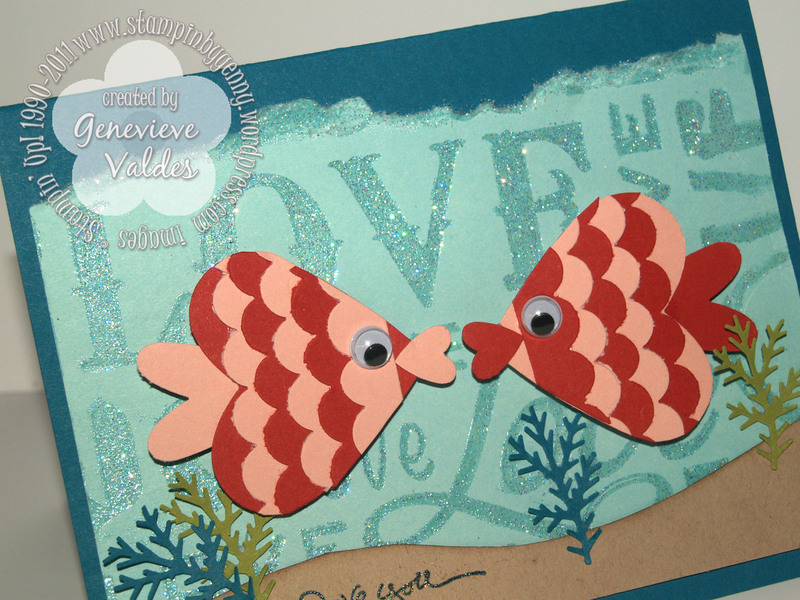 This week at Hand Stamped Sentiments we have a beach theme but I still have Valentine’s day on the brain. So when I began to think of what to create for this challenge I thought of the sea…love…Eureka! !…The Sea of Love! So here’s my interpretation of this week’s beach theme challenge. I used the Lots of Love Letterpress plate for the background. I inked it up with Versamark then ran it through the Big Shot and to add sparkle I heat embossed with Iridescent Ice embossing powder. The sentiment is stamped in Indigo Blue and also heat embossed with Iridescent Ice embossing powder. I hope you can see how the Sea of Love shimmers with the Iridescent Ice. 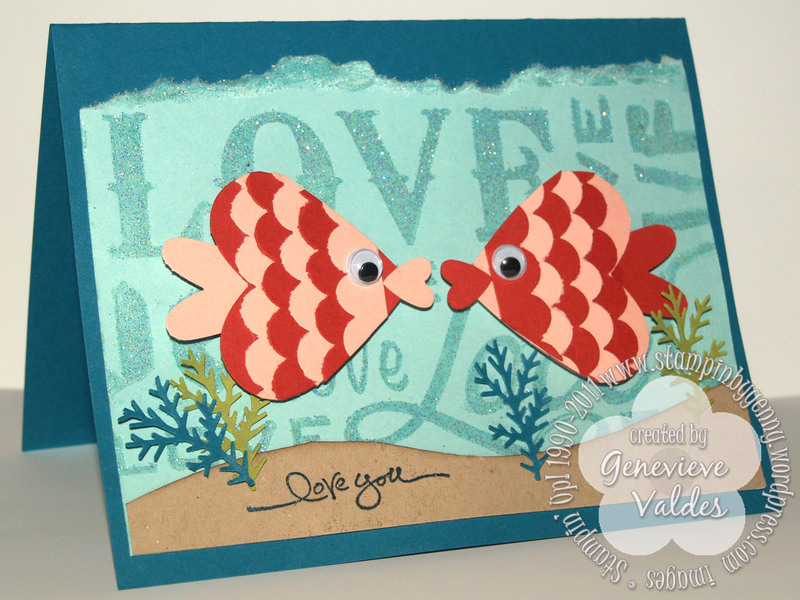 The fish are made with various Stampin’ Up! heart punches. I couldn’t resist the wiggle eyes. The sand is Crumb Cake card stock sponged with Soft Suede ink. This card would be perfect to give to your hubby or wife. Either way love is in the air or rather the sea. I hope you’re inspired to join us this week with your beach themed creation. 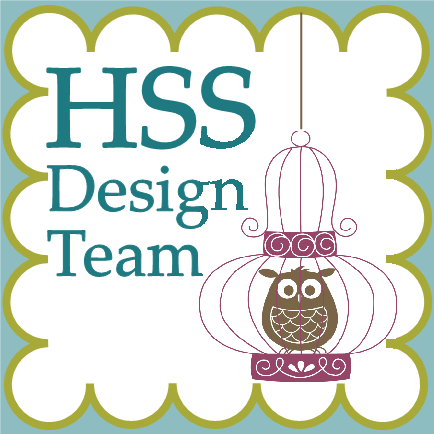 Hop on over to HSS for more inspiration from our very talented design team. This week at Hand Stamped Sentiments the challenge is Pleats and Ruffles. I’ve used lots of items from the new mini catalog to create this card. I love the bird image from the Take it to Heart stamp set. I used ink pads and blender pens to color the image. To give the image a bit more sparkle I used the tiniest bit of Cherry Cobbler Dazzling Details to the flowers. I also heat embossed the textured background with touches of gold embossing powder. Since the challenge calls for pleats or ruffles, I ruffled a piece of Victoria Crochet ribbon on a hat pin. The top of the pin also features small punched flowers. This is my first Valentine card of the season. Let me know what you think and also what your favorite items are from the new mini. This week at Hand Stamped Sentiments it’s all about buttons. Since I didn’t have a button I liked I decided to make a heart paper button. There is an easy to follow tutorial for making paper buttons on SCS. The dressmaker form can be found here. This card came together very quickly and was fun to make. Join us this week for our Button Challenge. 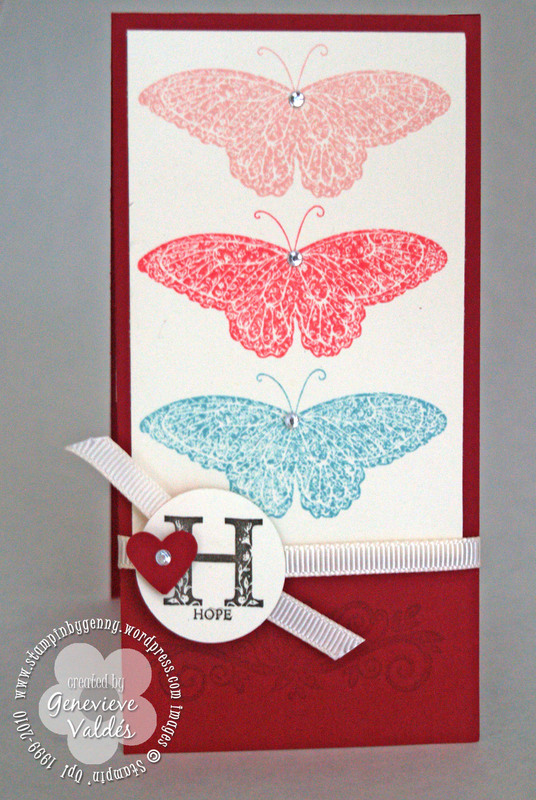 Strength & Hope Butterfly Card – Let’s Fight Breast Cancer! This past weekend I held a workshop and my make-and-take was a card I saw in the May issue of SUCCESS. SUCCESS is a magazine for Stampin’ Up! demonstrators and is a valuable tool to helping us with our business. I used the colors and punches I own to create the card. My customers loved making it. Plus it showcased the stamp set so well. With each purchase of this stamp set Stampin’ Up! will donate $2 to The Breast Cancer Research Foundation. BCRF is dedicated to preventing breast cancer and finding a cure in our lifetime by funding clinical and translational research worldwide.